Large eighteen-wheeler shipping trucks are responsible for several of the deadliest auto accidents that occur every year. The trucks, which are much larger than normal cars and take longer to slow down, can crush cars with their massive size and forward momentum. In all 2013 truck crashes with one other car and at least one fatality, 97% of the people killed were in the smaller vehicle. If your loved one has been killed or severely injured in a truck crash, or you have been injured in a truck crash, you should contact Findlay Personal Injury Lawyers. Ontario law gives you 120 days from the date of the accident to give the at-fault driver notice of your lawsuit, so get in touch as soon as possible. Call (855) 862-7258 for a free initial legal consultation. Tractor-trailer trucks are, on average, 20-30 times heavier than passenger cars. This massive difference in size explains the high fatality rate of car drivers and passengers who get hit by trucks, and illustrates why truck drivers need to be careful on the road. One mistake, and a truck driver can end several lives in the blink of an eye. You should be able to get accident benefits after a crash, but the cause of the accident may determine who is ultimately at fault. If the driver has driven more than 77 hours over a one-week period, the trucking company may be at fault for letting him exceed his weekly hours limit. On the other hand, if the brakes suffer a mechanical failure, you may wish to seek compensation from the manufacturer of the truck. Because the time frame for notifying the at-fault driver of a lawsuit is so small, it’s not a bad idea to call a lawyer immediately after you or your loved one’s accident. The more time Findlay Personal Injury Lawyers has to gather evidence, the more we can give your case the close personal attention that it deserves. Don’t let an unfortunate collision derail your life. 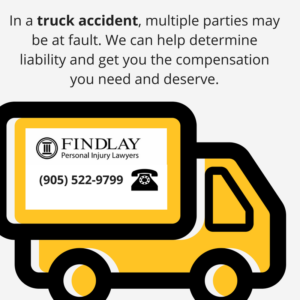 Contact Findlay Personal Injury Lawyers today to set up a free initial legal consultation with our truck accident lawyers! You can contact us online or by calling (855) 862-7258. We serve clients in Burlington, Stoney Creek, Niagara Falls, Hamilton, and throughout southern Ontario.